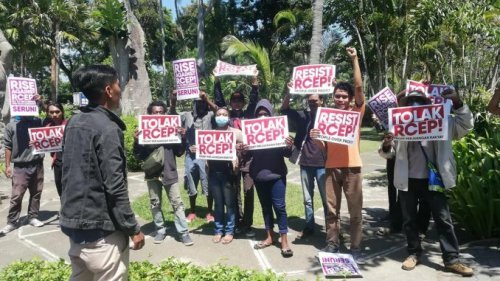 Members of SERUNI women’s organization, Front Perjuangan Rakyat (FPR), Papuan Student Alliance, and People Over Profit-Indonesia stormed the 25th meeting of the Trade Negotiating Committee of the Regional Comprehensive Partnership Agreement happening at The Westin Resort in Bali Indonesia. Through its services and investment chapters, RCEP will inevitably promote the contractualization of labor and would mean a race to the bottom for wages and labor standards. RCEP is set to further facilitate forced migration and labor export as it neglects to address the root causes of unemployment without prioritizing the development of key national industries to produce home-grown quality jobs. The trade deal will violate farmers’ rights to seeds through provisions on intellectual property that force member countries to join the UPOV 1991 – essentially facilitating corporate ownership of seeds while restricting seed access to poor peasants and farmers. Furthermore, RCEP will infringe on the rights of indigenous peoples and farmers to land and resources, their right to development and self-determination. Through its endorsement of the Investor-State Dispute Settlement (ISDS), RCEP will further deregulate destructive and extractive mining operations that harm the environment and the people who depend on it. Its investment and intellectual property chapters will undermine the people’s right to health by restricting public access to health services and access to cheap, life-saving medicines by extending patent rights and allowing big pharmaceutical companies to monopolize drug production. Like any 21st century FTAs, RCEP remains negotiated behind closed doors with only corporate lawyers and lobbyists given full access to the text. This lack of transparency and the absence of genuine and meaningful participation of people’s organizations and civil society groups raises concerns on the legitimacy of the negotiation process. “Clearly, RCEP is merely a global capitalist tool that will drill this region further down to poverty and misery. In return, RCEP will be met by relentless rejection by the oppressed peoples of the global south leading to its inevitable failure.” Retno concluded.